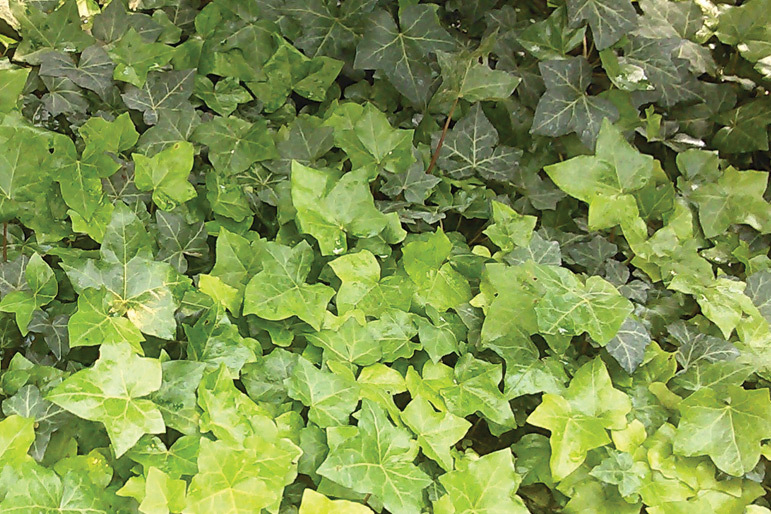 De-vine Trees | John B Ward Co.
English Ivy, if left unmanaged, can inhibit tree growth. Vines are everywhere in the urban forest, especially along the edges of our parks, woodlots, highways, and natural areas. Vines take advantage of these open, disturbed sites where they can scramble over the undergrowth and climb up the tree trunks into the canopy. Vine growth responds to sunlight and higher levels of carbon dioxide to quickly cover the tree canopy. Some vines like Poison Ivy and English Ivy grow thick up the trunks of trees. They do not girdle the tree trunks like twining vines do, however, left unmanaged they will grow out on the limbs and inhibit tree growth. Poison Ivy contains the toxin urushiol that can cause severe rashes. Surface area of vines in trees significantly add weight causing trees to fail under the additional stress. Vines that twine like Bittersweet, Wisteria, and Halls Honeysuckle will wrap around stems and girdle the trunks. These vines choke a young woodland of potential growth. It seems that some vines have increased their presence over the last few decades. Porcelain-berry with purple edible fruits attractive to birds is much more abundant today. The annual Mile-a-minute vine does not leap into the upper canopy, it scurries over the understory preventing tree sapling development. It was introduced into Pennsylvania and has spread rapidly. Even kudzu vine has established in our area and can smother acres of field and forest edge. Vines do have a healthy niche in a mature forest where they add diversity and new growth. However, in our young, highly disturbed urban forests, vines should be managed to allow for optimum tree growth and canopy cover. We recommend keeping vines out of the trees and on the trellis or wall where they can contribute to the greening of our gardens.